154 records – page 1 of 4. Photograph of Florence (Hart) Godwin on the steps of the Hart House taken in 1987. Caption on original matte read: "Florence (Hart) Godwin. Photo taken on the front steps of the Hart house, 1987. F.J. Hart, Florence's father, built the house in 1910. 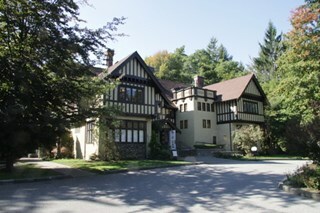 The home has recently been renovated and is slated to be officially opened as a restaurant in September, 1988 and called the "The Hart House by Deer Lake". Photograph of the Hart, Hill and Peers families, including Kingsley Hart, who was later killed in the First World War. 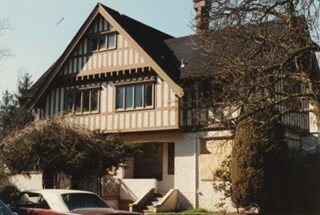 The photograph was taken at 6664 Deer Lake Avenue. 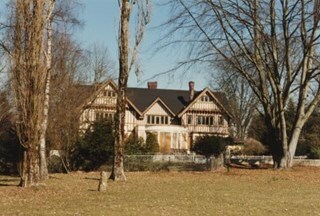 Photograph of Hart House, also called "Avalon," the Hart family home on Deer Lake. Photograph of the Hart House and street lights. 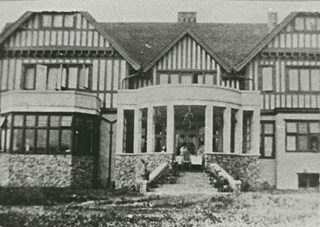 Newspaper clipping glued to verso of photograph reads: "Old-world elegance is a key feature of Deer Lake Park's latest aquisiton, the Riley House." 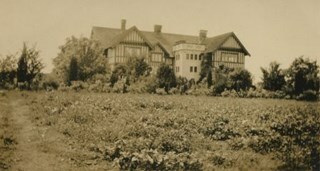 Stamp on verso of photograph reads: "COLUMBIAN PHOTO BY BASIL KING"
Photograph of the Hart House and front yard. 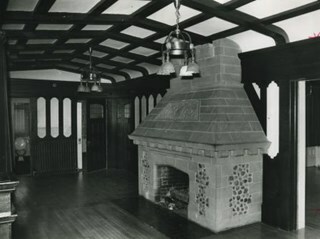 Photograph of the interior foyer at the Hart House, complete with stone fireplace and dark wood panelling. Newspaper clipping glued to verso of photograph reads: "Massive stone fireplace greets visitors in heavily-panelled entrance hall." 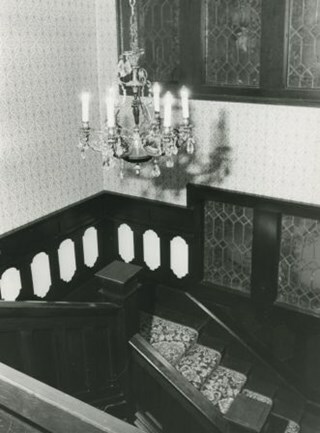 Photograph of the interior staircase at the Hart House, complete with chandeliers and leaded glass windows. Newspaper clipping glued to verso of photograph reads: "Chandeliers and leaded glass windows grace stairway to second floor." 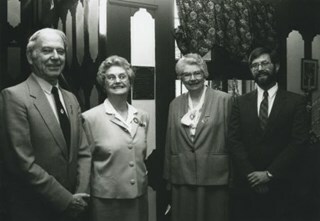 Photograph of Ann Macey, Nick Volkow, Hazel L'Estrange, Don Brown and Lane Macey at the plaque dedication for the architect Frank W. Macey taking place inside the Hart House. Lane Macey is the grandson of Frank W. Macey. 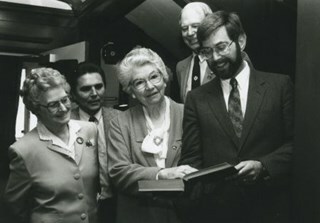 Photograph of Don Brown, Ann Macey, Hazel L'Estrange, and Lane Macey at the plaque dedication for the architect Frank W. Macey taking place inside the Hart House. Lane Macey is the grandson of Frank W. Macey. 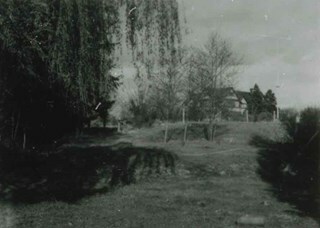 Photograph of the Hart House and surrounding property. 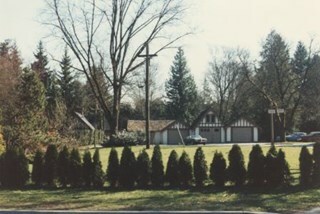 Photograph of the side of the Hart House and its surrounding property. 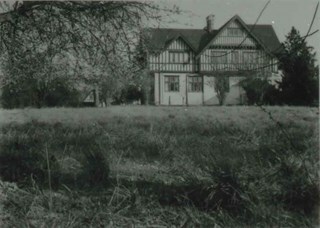 Photograph of the exterior of Hart House, taken from the Pugh family house. 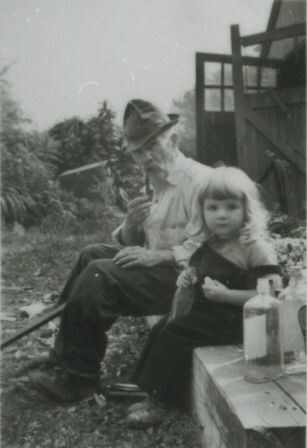 Photograph of Bill Dunbar and Annie Gordon (later Annie Frisby) seated outside the Hart House garage. 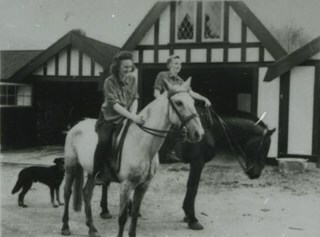 Photograph of Dodie Rutherford (later Banford) and Rolie Moore-Pierce on horseback at Hart House. Photograph of a field of flowers at Hart House. 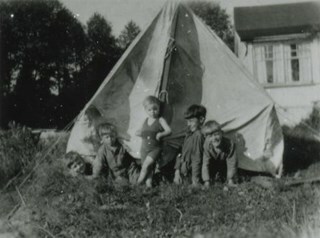 Photograph of five children outside a tent in the yard of Hart House. 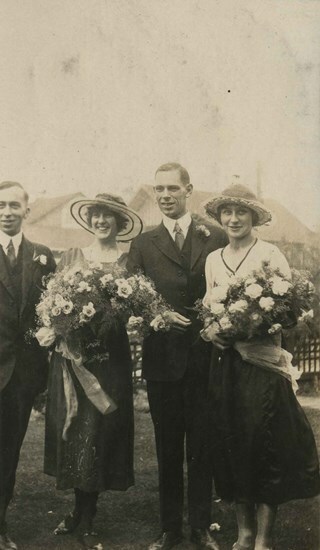 Likely, left to right: John, Dinty, Anna, Sonny (Monty), and Harold Moore. 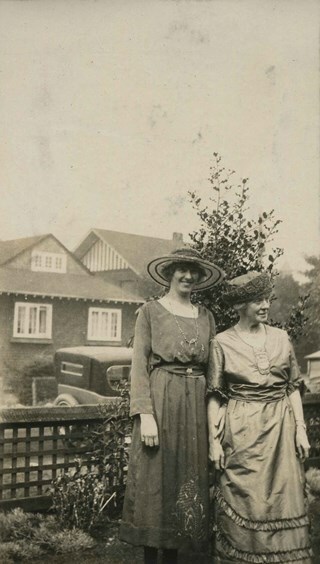 Photograph of (left to right) Rolie Moore, Grandmother Moore and Hazel Moore outside of Hart House. Grandmother Moore is seated in an ornate chair. Photograph of Anna and William A. "Dinty" Moore at Hart House. 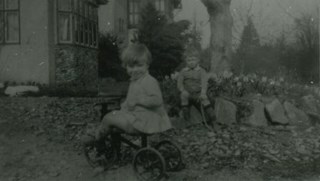 Anna is seated on a tricycle. 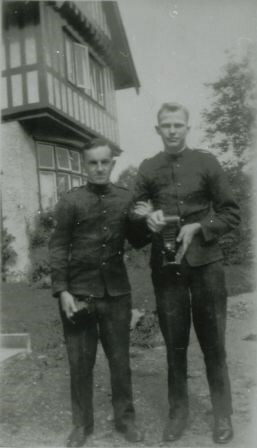 Photograph of Chip and Roy, two Australian soldiers or sailors, at Hart House. They are in uniform, and one of them is holding a camera. 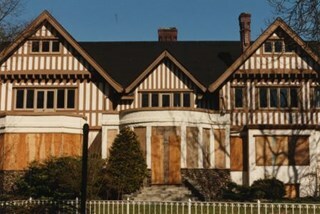 Photographs of the Hart house with all the windows and doors boarded up. 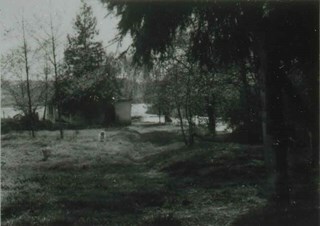 Photograph of the coach houses and outbuildings of the Hart House, in Deer Lake Park. Photograph of the exterior of the Hart House, with the windows and doors boarded up with plywood. 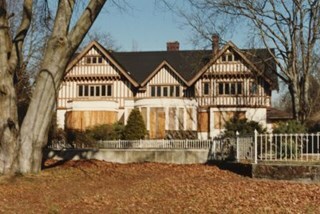 Photograph of the exterior of the Hart House with the windows boarded up. Photograph of the exterior siding details of the heritage building known as the Hart house, in Deer Lake Park. 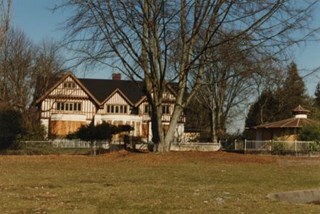 Photograph of the Hart House, in Deer Lake Park. Photograph of the Hart House, with windows and doors boarded over with plywood. 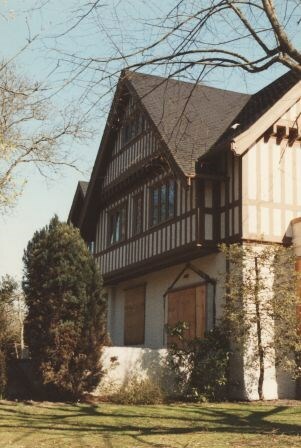 Photograph of the Hart House as it looked in 1990. 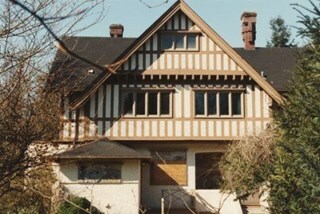 Photograph of the Hart House as it appeared in 1990. 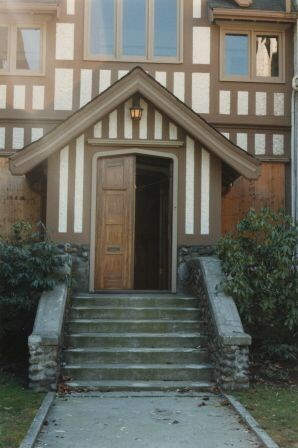 Photograph of the entranceway to the Hart House, in Deer Lake Park. 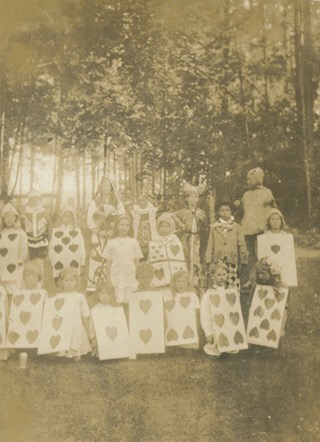 Photograph of a group of children dressed up for an Alice in Wonderland party held as part of the St. Alban's Strawberry Social in 1912. 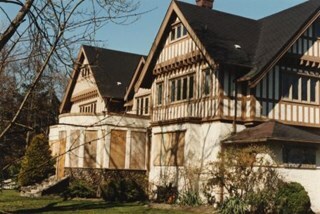 The party was held at the Hart House, the estate belonging to Frederick J. Hart in the Burnaby Lake area. 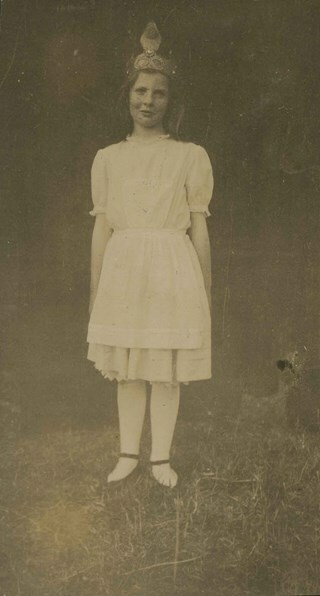 Photograph of Cathleen Mathers dressed in a costume for an Alice in Wonderland party held as part of the St. Alban's Strawberry Social, 1912. 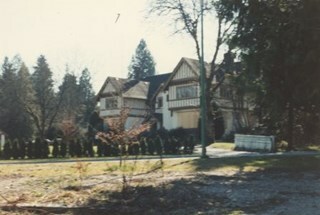 The party was held at the Hart House, the estate belonging to Frederick J. Hart in the Burnaby Lake area. Photograph of children enjoying an Alice in Wonderland party held as part of the St. Alban's Strawberry Social, 1912. 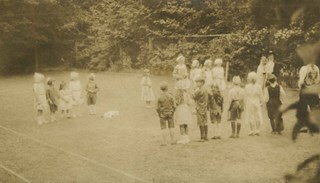 The children are playing a game on the lawn at the Hart House, the estate belonging to Frederick J. Hart in the Burnaby Lake area. 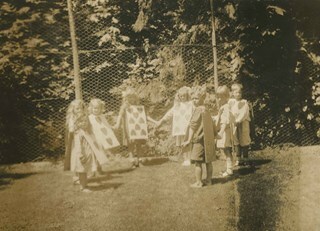 Photograph of a group of children holding hands in a centre, all wearing costumes for an Alice in Wonderland Party. 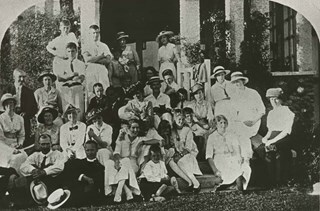 This party was part of the St. Alban's Strawberry Social, 1912, and was held on the grounds of the Hart House, the estate owned by Frederick J. Hart. 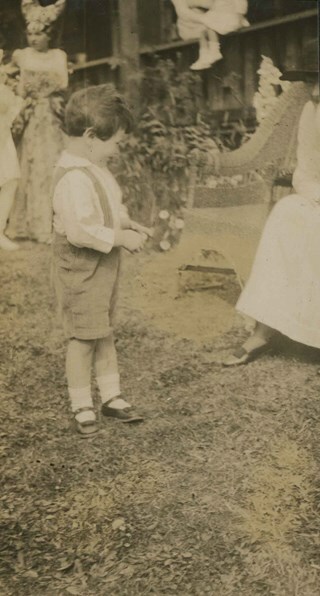 Photograph of a young boy standing beside a chair at the Alice in Wonderland Party that was held as part of the St. Alban's Strawberry Social, 1912. 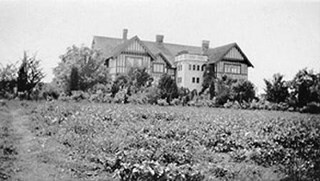 The party was held on the grounds of the Hart House, the estate owned by Frederick J. Hart in the Burnaby Lake area. Photograph of Florence Hart (left) and her mother, Alice Hart (right) on Florence's wedding day. Florence was the daughter of Frederick J. Hart and she married Harold Godwin. 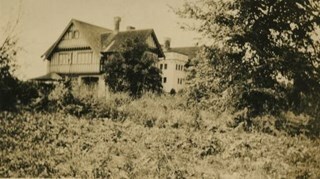 The picture was taken on the grounds of the Hart House. 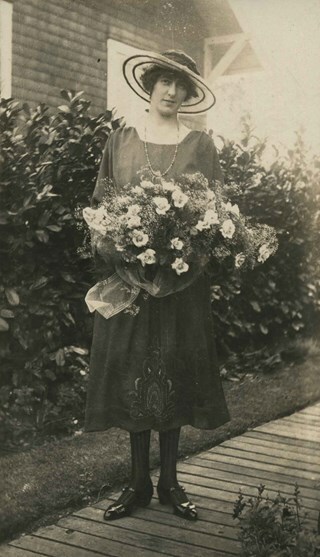 Photograph of Florence Hart, on her wedding day, holding a bouquet of flowers. 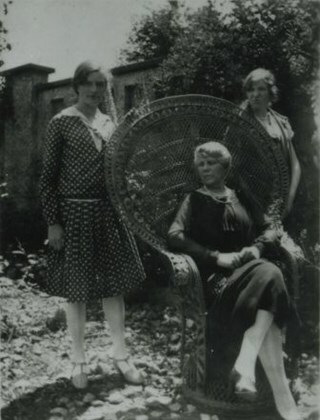 Florence was the daughter of Frederick and Alice Hart and she married Harold Godwin. Photograph of (l to r): unidentified man, Florence Hart, Harold Godwin and Kitty Hill. Florence Hart was the daughter of Frederick J. and Alice Hart and she married Harold Godwin. Kitty Hill was a member of the wedding party. 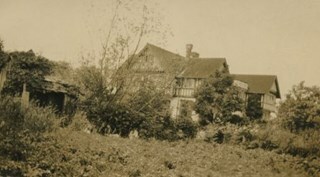 This photograph was taken on the grounds of the Hart House.